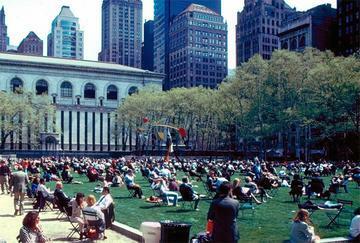 A summer day in NYC’s Bryant Park, a stand out example of placemaking. All around the world, urban planners are coming up with new ways to encourage people to get more out of their cities. One of the biggest trends is “place making” (or placemaking, as people in the field call it). That’s taking a public space, and adding new elements so that people want to come there. There are dozens of successful placemaking projects across the United States. Think of Bryant Park in New York City, Eastern Market in Detroit, and Guerrero Park in San Francisco. All of these places have been around for years, but they’ve all seen a revival in the past decade or so, thanks to what takes place in them. Researchers at the Massachusetts Institute of Technology have written a major new white paper on placemaking, which you can read here. One of the biggest benefits of placemaking may wind up being what it does to the way people get around. Fred Kent, founder of the Project for Public Spaces, says placemaking can boost public transportation, and encourage people to get out of their cars.